This Sunday, March 25, Government Auction will conduct one of its most diverse sales yet. Internet live bidding will be provided by LiveAuctioneers.com. A special highlight section of the sale consists of early 20th century phonographs, antique music boxes and vintage slots. Most of the items have been fully restored and are in very good working order. “Care was taken to ensure they were preserved correctly for generations to come,” said Government Auction’s Paul Sabesky. One of the top lots of the sale is an antique miniature Dewey 50-cent slot machine. Handmade of solid oak, it is one of only a few such machines that were produced. It is expected to make $24,000-$48,000. A 1947 Watling rol-A-Top checkerboard twin jackpot slot machine operates on nickels. A real eyecatcher, it is estimated at $10,200-$20,400. Leading the antique phonographs is a Victorian oak horn-model Victor model, which is estimated at $21,000-$42,000. 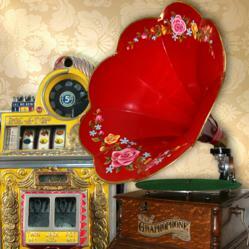 Another beauty, an antique countertop phonograph player has a vivid red morning glory horn. It has an estimate range of $3,300-$6,600. An extremely rare and early polyphon music box is in absolutely mint condition and ready to entertain. Its estimate is $3,300-$6,600. Other treasures featured in the auction include gold coins, high-end jewelry, appraised gems, framed art, prints, bronzes and prime land parcels. The auction will commence at 7:30 a.m. Pacific Time - 10:30 a.m. Eastern Time on Sunday, March 25. For additional information on any lot in the sale, call Debbie on 661-823-1543 or e-mail info(at)governmentauction(dot)com. All assets that we offer are normally at a 30% - 60% savings to you. What this means is you are making a good investment immediately. By purchasing assets cheaply you can make a sizeable profit if you decide to resell it later on.